A gone fishing portfolio is a portfolio of just a few stocks which should weather the ups and downs of the market fairly well while only rebalancing twice a year. Our annual gone fishing portfolio recommendations are very popular. As a fee-only financial planner, our portfolio recommendations emphasize low cost exchange traded funds. We have no incentive to recommend a fund other than the fact that we believe its costs are worth the value it brings to the portfolio as a whole. And that has gained the trust of many do-it-yourself investors. 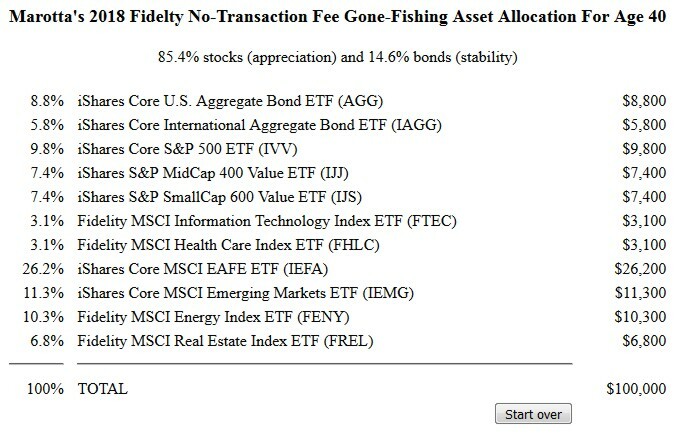 Recently, a reader requested that we craft a Fidelity Gone-Fishing Portfolio limiting our selections to the 95 exchange traded funds (ETFs) where Fidelity currently offers commission-free trading. This article explains each fund we used when crafting a gone fishing portfolio for accounts hosted at Fidelity. We also have custodian-specific portfolios for Schwab, Vanguard, and TD Ameritrade as well as our default Marotta’s 2018 Gone-Fishing Portfolio. For US Bonds, we selected iShares Core U.S. Aggregate Bond ETF (AGG) from Fidelity’s selections with an expense ratio of just 0.05%. For foreign bonds, we suggest using iShares Core International Aggregate Bond ETF (IAGG) with an expense ratio of just 0.09%. That being said, you could substitute iShares J.P. Morgan USD Emerging Markets Bond ETF (EMB) for foreign bonds. Even though EMB has a higher expense ratio of 0.40%, emerging market bonds may perform better than generic foreign bonds. They will, however, also be more volatile. The lower volatility is ultimately the reason I have chosen to use IAGG instead of EMB as stability is the purpose of bonds in a portfolio. Since Fidelity’s foreign stock selection is limited, we’ve expanded the diversification of US stock investments. For large cap, we selected iShares Core S&P 500 ETF (IVV) with an expense ratio of just 0.04%. 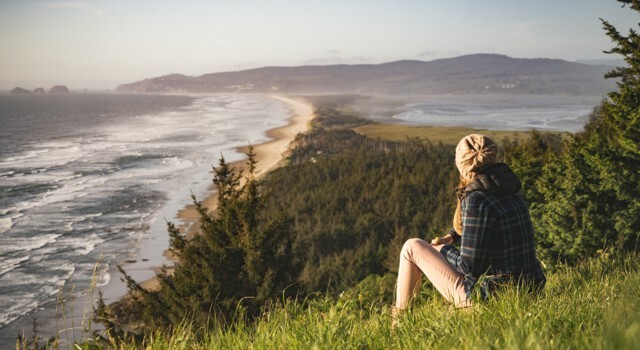 For mid and small cap value, we are using iShares S&P MidCap 400 Value ETF (IJJ) and iShares S&P SmallCap 600 Value ETF (IJS) each of which has an expense ratio of just 0.25%. We have also included an allocation to the two sectors of Technology and Healthcare by using Fidelity MSCI Information Technology Index ETF (FTEC) and Fidelity MSCI Health Care Index ETF (FHLC) each of which has an expense ratio of just 0.084%. For foreign stocks, Fidelity’s no-transaction fee ETFs only offer Japan, China, and India, none of which are among the countries high in economic freedom. As a result, we are only using two selections: iShares Core MSCI EAFE ETF (IEFA) with an expense ratio of 0.08% and iShares Core MSCI Emerging Markets ETF (IEMG) with an expense ratio of 0.14% which are developed markets outside of the U.S. & Canada and the Emerging Markets respectively. Finally for resource stocks, we are using Fidelity MSCI Energy Index ETF (FENY) and Fidelity MSCI Real Estate Index ETF (FREL) both with an expense ratio of just 0.084%. This sample asset allocation would have an expense ratio of just 0.107% which translates to just $106.89 per year for a portfolio of $100,000. Visit our Marotta’s 2018 Fidelity Gone-Fishing Portfolio Calculator to craft an appropriate allocation for your portfolio.